I have backed out of a lot of parking spaces in my life, but today is different. As I adjust the mirrors, fasten the safety belt, turn on the ignition, and put the Lexus RX450h SUV in reverse, I feel the scrutiny of my passengers, professionals who may be skeptical of my ability to control the vehicle. I make a couple of turns, and then, on a dashboard display that I’m not allowed to describe to you (trade secret! ), something turns green. That’s my signal. I press a button on the steering column, and a female voice accompanied by an icy synthesizer note — the kind of thing you hear when monorail doors are about to close — intones the word, “Autodrive.” Something catches in my throat; it may be the closest thing I’ll know to flying the Millennium Falcon when it thrusts into hyperspace. In truth, not much really changes. The Lexus rolls forward and rambles down a street in a neighborhood that is all streets and no buildings or people, a Potemkin village of roadways. There is an intersection ahead with a stop sign. The car stops. My foot has not touched the brake. I am behind the wheel of a Google self-driving car. 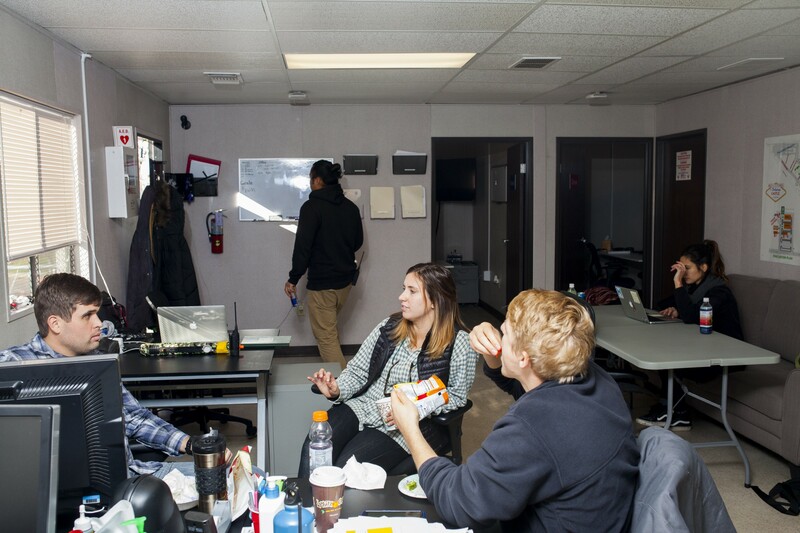 Mission control at Castle is a double-wide trailer that seems more like the op center at a construction site than a dispatch center for the future. There are desks, a ratty sofa, and instead of the high-end espresso maker commonly found at the company’s facilities, a coffeemaker that Joe DiMaggio would recognize. The most Googley objects are what look like military-grade water ordnance; they are actually Bug-a-Salt rifles that shoot pellets at the swarms of insects that are ubiquitous during the Central Valley summer. Lunchtime at the Castle facility. I was in, and not just for the opportunity to sit in the front seat of Google’s car. 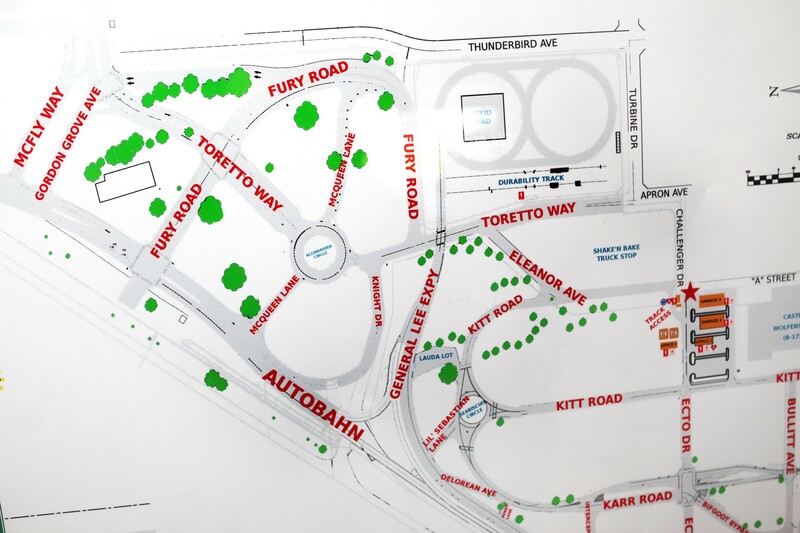 In the process, I was rewarded with a very rare look at Google’s SDC industrial complex, a co-evolved infrastructure of hardware, software, drivers, and engineers that the company hopes will contribute to its argument that autonomous systems are the future. Torcellini says that not-driving on public roads felt intuitive — after all the hours he spent in the parking lot, he was used to sitting behind the wheel of a car that drove itself. Initially, testing was limited to highway driving. But in early 2014, Google felt it had essentially mastered the elements of highway driving and focused on the knottier problems of street driving. Test-driving at the Castle facility. 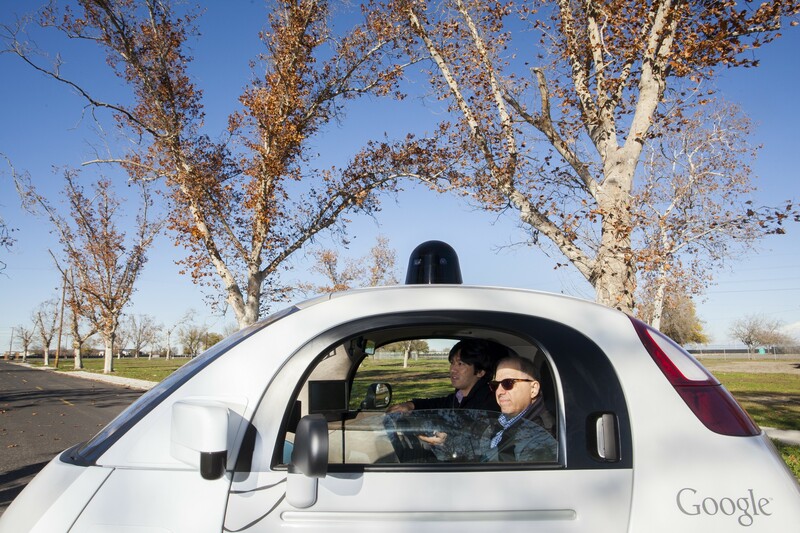 Urmson and Dolgov hand-certified the first two dozen or so drivers, but now that more were coming on, Google needed set up a more formal system of training. Torcellini, now head of operations for the testing program, helped to create it. Along with gaining new responsibilities, he became one of the lucky drivers who moved from contractor status to full-time Googler. “It’s much more structured, and we teach people exactly what they need to know,” he says of the formal program. 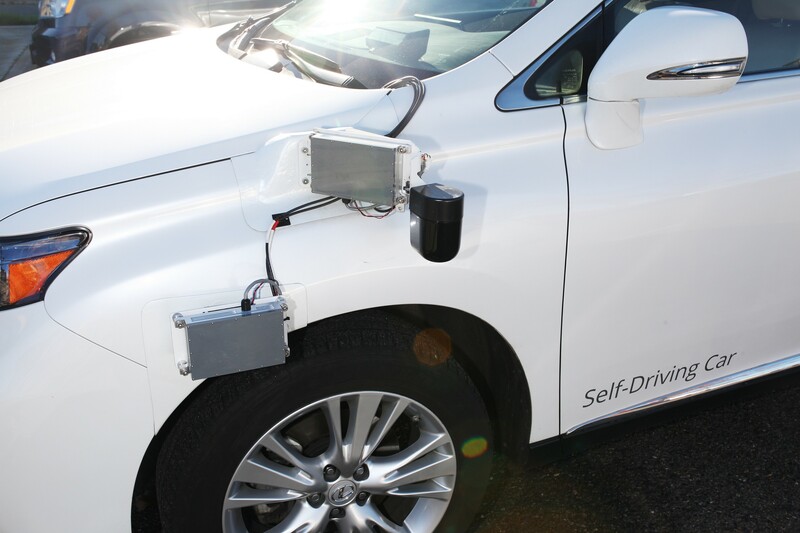 The company does not say how many test drivers it uses, but you can do the math yourself: There are 53 self-driving cars currently involved in the program, a mix of Lexuses and the little bug-like prototypes that go no faster than 25 miles per hour. Every day, most of the cars go out on the streets of Mountain View, California, and Austin, Texas, in day and night shifts, typically with a driver and a c0-driver. Google doesn’t share how much they are paid, but it’s safe to say that it’s a lot less than an engineer gets. Map of the Castle facility. In the first week of the training program, drivers come to Castle for experience in the closed setting. They start off with classroom instruction, then navigate the Castle course. At first, they do simple cruising, but as the week goes on, the driving conditions get “spicier,” to use the terminology the group uses to depict increasingly challenging scenarios. 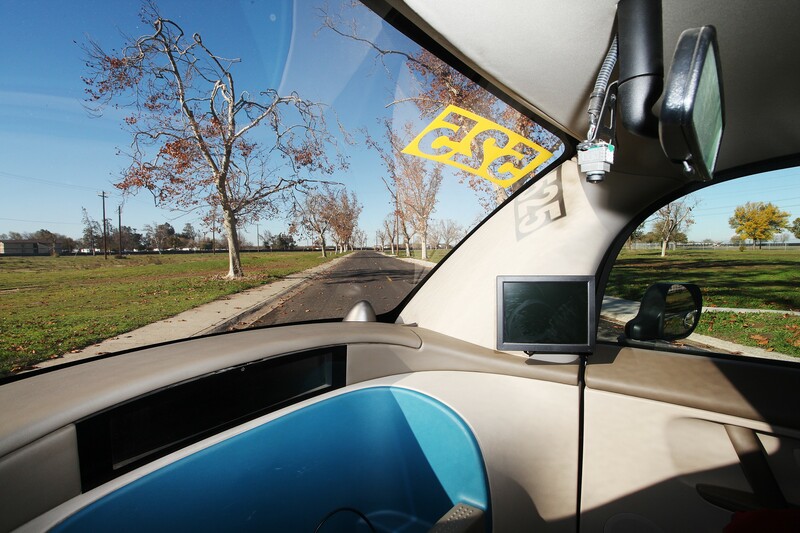 The safety drivers must share the road with human-driven conveyances, including rental cars commandeered by experienced safety drivers or bicycles borrowed from the company’s headquarters. 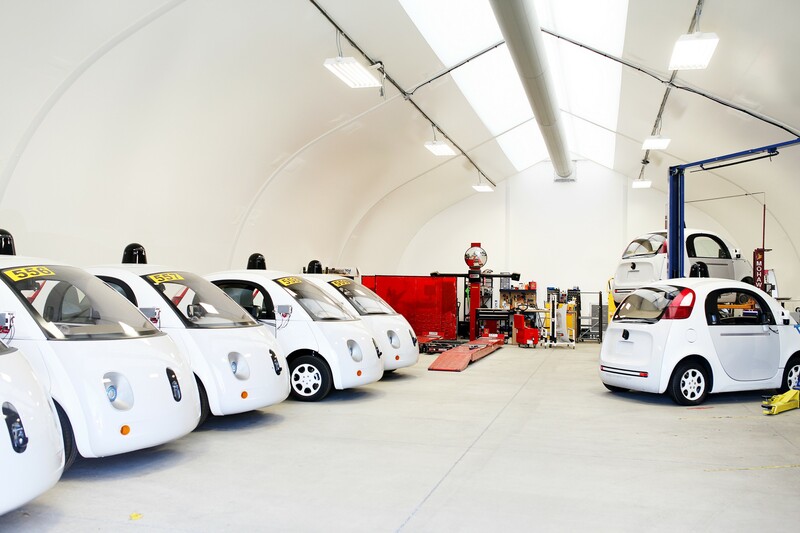 Those bikes are only one kind of prop used in testing, many of which are stored in a big shed to the side of the trailer and a wide garage that holds a small fleet of Google’s prototype custom-built self-driving vehicles. 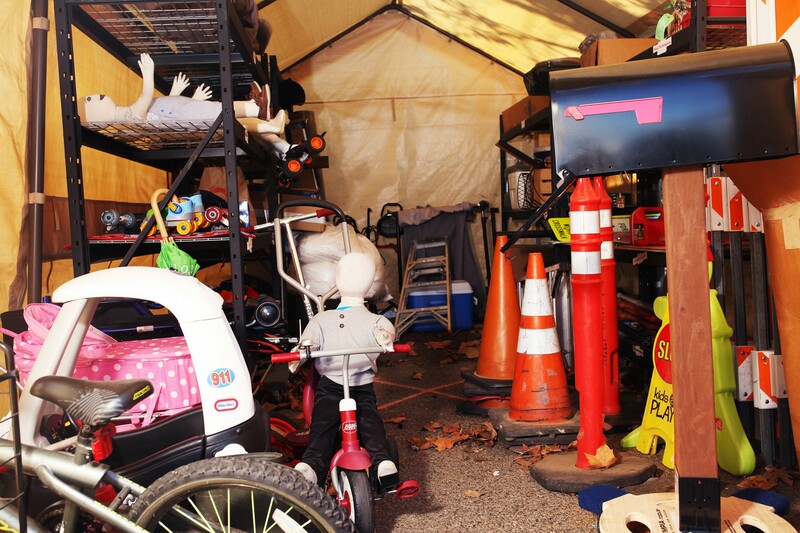 Villegas calls the shed “my toy chest.” There are traffic cones, road signs depicting various hazards, mailboxes, faux plants, roller skates, umbrellas, walkers, and — this is unsettling — fully dressed, child-size dummies. Sometimes Google uses human props, known as “professional pedestrians.” I had the chance to chat with one, a recent graduate of UC Merced (a good source for Castle workers) named Cassandra Hernandez. She took the job while matriculating and still punches in a few times a week. Since I encountered her on a Monday, her tasks that day were “not very spicy.” But on Thursdays, she assures me, the action is jalapeño-level. Does she ever get nervous participating in scenarios where she might be plowed under by a berserk robot Lexus SUV — or, in a more humiliating nightmare, a Herbie-esque prototype? Not really. “We just have to learn to trust,” she says. For my own experience, I also wanted to test one of the tiny prototypes, built from the ground up as autonomous vehicles but retrofitted with pedals and steering so they could be tested with the driver teams. But Google was firm in denying me that. I was okay with that decision when I learned Google allows only its most experienced safety drivers—those who’ve worked at the job for six months to a year—to handle the cute little bugs, and then only when they return to Castle for more training. I got to watch a few during their first attempts to master manual control on these nippers. It’s kind of tricky: The steering wheel, more like a joystick installed on its side to the right of the driver, works like a crank, with the driver gripping a handle (they call it the “corn dog”) to spin the device, like turning a gear. “It only takes a few hours to get used to,” says Jared Mendiola, the operations manager in charge of the process. Clearly, the drivers acclimating to these bugs have not notched those hours yet. 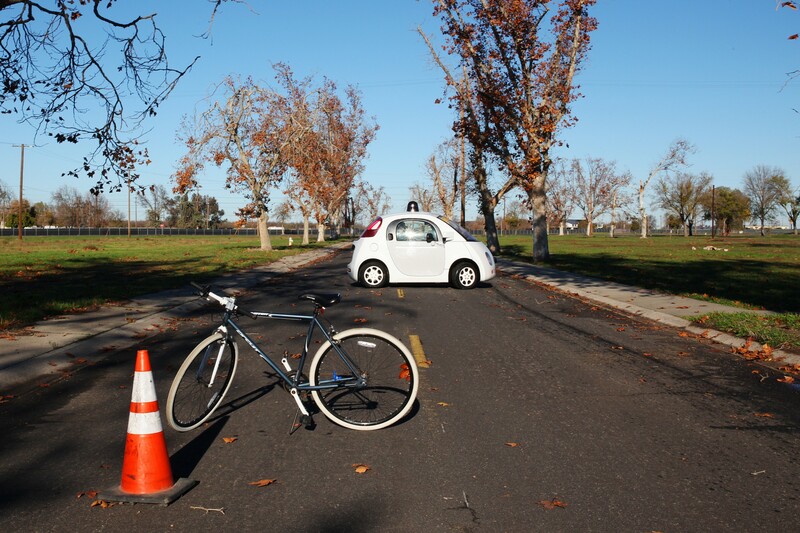 No traffic cone is safe as they try to negotiate a slalom course in reverse. So I was fine with my chance to (not) drive an autonomous Lexus. That would be plenty. Greg Hanabusa, an operations manager for the project, is my instructor. The training session takes place in Maverick (conference rooms at Castle are named after characters in Top Gun). The term for switching back from autodrive to manual driving is “disengage.” Hanabusa explains there are two kinds of disengagements: desirable and undesired. The first kind includes discretionary reasons like going back to base, taking a meal break, or making a phone call. “In our safety policy, we don’t allow phone calls,” says Hanabusa. Google also instructs its drivers to disengage when they encounter reckless drivers or tailgaters. These can be common, because sometimes human drivers get overly curious when sharing a road with a car driving itself. The undesired disengagements are when the car or the software isn’t behaving correctly, or some real threat emerges. In those cases, the car itself bails — too spicy for robots! The most valuable tool the test team has for making sure things are running smoothly is the laptop on the co-driver’s lap. Using an interface called x_view, the laptop shows the world as the car sees it, a wireframe representation of the area that depicts all the objects around the car: pedestrians, trees, road signs, other cars, motorcycles—basically everything picked up by the car’s radar and laser sensors. X_view also shows how the car is planning to deal with conditions, mainly through a series of grid-like “fences” that depict when the car intends to stop, cautiously yield, or proceed past a hazard. It also displays the car’s path. Every time a driver disengages, the Googler riding shotgun must make note of it. A pin is automatically inserted in the map of the trip, and the co-driver jots down a brief explanation. In a typical trip, there will probably be a number of those, sometimes dozens. At the end of the shift, the entire log is sent off to an independent triage team, which runs simulations to see what would have happened had the car continued autonomously. In fact, even though Google’s cars have autonomously driven more than 1.3 million miles—routinely logging 10,000 to 15,000 more every week — they have been tested many times more in software, where it’s possible to model 3 million miles of driving in a single day. The team analyzes each disengagement, assessing which ones to send to the engineering team, who will address the flaw that necessitated the disengagement. At least once a week, there’s a new build of software that incorporates the fixes and includes other new features. Drivers then comment on whether the changes improve or degrade performance. Other times, engineers will develop scenarios to see how cars do in certain situations and construct them, like little automotive theater pieces, at Castle. If you’re riding shotgun, the demands on your attention are just as rigorous. Comparing x_view to the actual world requires attention and the ability to type notes for the engineers in a moving vehicle. “That’s it,” says Hanabusa. Four weeks of training in less than an hour. Time to (not) drive. Google also believes that cars should be able to move around even with no humans in them, and it has been hoping for an official go-ahead to begin a shuttle service between the dozens of buildings it occupies in Mountain View, where slow-moving, no-steering-wheel prototypes would putter along by themselves to pick up Googlers. It was bitterly disappointed when the California DMV ruled it was not yet time for driverless cars to travel the streets, even in those limited conditions. The DMV didn’t even propose a set of requirements that Google could satisfy to make this happen. Meanwhile, Elon Musk, CEO of Tesla, is barreling ahead, introducing a driverless feature in his Tesla cars called Summon. He predicts that by 2018, Tesla owners will be able to summon their cars from the opposite coast, though it’s a mystery how the cars would recharge themselves every 200 or so miles. But maybe Musk is not the first. When I discussed this with Urmson, he postulated that in most states — California not among them — it was not illegal to operate driverless cars on public streets. I asked him whether Google had sent out cars with no one in them to pick up people in Austin. He would not answer. Because the number of incidents where Google SDCs caused actual collisions is zero, the report proves two things: By its own admission, the cars are not yet as safe as Google wants and expects them to be, and the Google training program is quite effective, preventing 13 out of 13 situations where the car might have made unwelcome contact. In addition, when these disengagements were vitally needed, the drivers took an average of .84 seconds to take control. 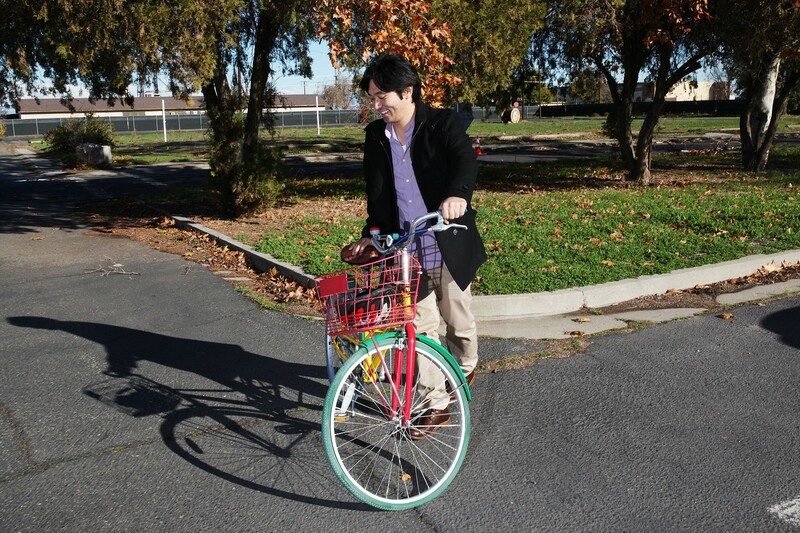 I gained a better idea of how Google works on actual streets by riding as a passenger in a sortie through the streets of Mountain View. (No way they would let me sit behind the wheel.) My drivers were the aforementioned Dmitri Dolgov and Nathaniel Fairfield, both principal engineers who have been with the project since the beginning. One reason they stick to those not-so-mean streets is that Google has carefully mapped them. Mapping streets for autonomous driving is a far more comprehensive task than collecting Street View data. Roads have to be traveled several times so that lasers and radar can pick up all the roadside features and peculiarities. The way Google has rigged its cars, they simply will not operate autonomously if they are not in a mapped location. (When we drove to Castle in a self-driving Lexus, it was manual all the way.) They also won’t run during moderate to heavy rainfalls. We headed out of the newish Google X headquarters (which began life in 1966 as a shopping mall). Right away, we ran into a spicy situation: After braking fully for a stop sign, the car was confronted with a steady stream of traffic on the busy road where it intended to make a right turn. The car nudged, nudged, nudged forward but would not do what any experienced driver would have done — aggressively edged into an opening, even if it meant that one of the northbound vehicles might have had to slow down or touch the brakes a bit. Instead, the car seemed paralyzed, and you could almost smell its fright and confusion. Dolgov disengages — just to hurry things along, the car would have eventually found an opening — and Fairfield duly noted it. From there, it was a fairly routine ride, remarkable only for the car’s ability to drive pretty much like a human. The one difference, as in the case of the first stop sign, was that the car displayed timidity when faced with a situation where aggressiveness was called for. Urmson later explained that in the current software build, the team was specifically experimenting with the caution/aggression issue, and that could have accounted for a behavior the system might have mastered earlier. It turns out I was unaware of the biggest event of our jaunt. At one point, the car drove over a small pile of leaves that had blown into its path, without breaking its pace. After the drive, Dolger and Fairfield told me that moment represented a ton of work. Apparently, for a very long time, SDCs regarded such harmless biomass as obstacles to be avoided, and the newfound ability to roll right over a bit of dead foliage was one of the more recent triumphs of technology. Finally, it’s time for my test-drive. Greg Hanabusa is my co-driver. In the backseat is Stephanie Villegas; it’s common for two operations people to monitor a rookie driver. Crowding beside her are a Google PR person and my photographer. I’m more nervous backing out of the parking space than I am at the prospect of driving a car that drives itself. After all, who can blame me if something goes wrong? It’s the ultimate no-fault. The most impressive moments came when the car exited a turn and accelerated, especially as it hit a little strip of open road that represented highway driving. It moved confidently but not recklessly. “I know what I’m doing” was the message I got from the robot car. I felt I was in good hands, even as I made sure my hands were within an inch of grabbing control. But at other times, you can tell SDC is programmed to emulate something with a Florida license plate. When the light turns green, it waits a couple of seconds (1.7 seconds, to be exact) before proceeding, just in case someone’s running the light. Drivers these days! I test various ways to disengage: The “off” button on the steering wheel (the easiest), the accelerator, the brake, and the steering wheel. (This last is the trickiest because turning the wheel often means veering from what is already the optimum direction.) All seem to work fine. 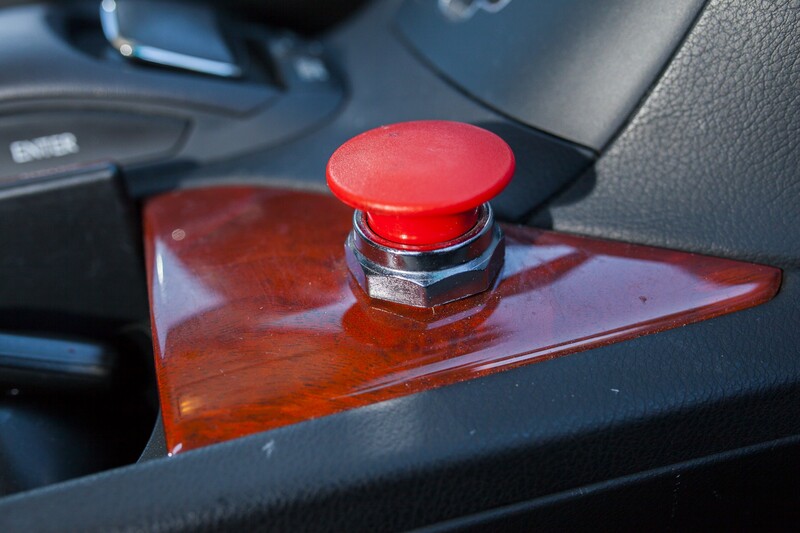 On advice of my co-driver, I do not test the Big Red Button. I do get a glimpse of how being a test driver might be tedious. Though the motion of the car is utterly familiar, managing a Google self-driving car is anything but carefree. Because I’m a hair trigger away from disengagement, I have to pay a lot more attention than is required from actually driving. And after the novelty wears off, it’s also a bit boring. I feel like I’m moving in an amusement ride before the scary part starts. Can we order some spice? The diciest part of my ride comes after a stop on a stretch of roadway dotted with traffic cones representing a construction area. The car slows to a crawl. A very slow crawl. And then it’s hardly moving. It’s clearly unhappy. I’m told to disengage. My co-driver duly notes the incident. In a little while, the green signal comes on and I’m ready to go again. Synth tone… “Autodrive.” Can’t get enough of that. Finally, it’s time to disengage for the last time. I do it via the “off” button on the right side of the steering column and drive on my own for a bit before pulling into a parking space near the trailers. Done. And I have no idea when I will next sit in the driver’s seat of an autonomous car. Two big takeaways. I have adjusted my view of how long it will take before we are all driving around in robot cars to later rather than sooner. From Google’s steady stream of upbeat reports — all those miles safely driven, with the only accidents being fender benders that were totally the fault of those goddamned human beings — I had come to assume we were almost there. (Who am I to contradict Sergey Brin and Elon Musk?) But sitting in the Lexus under orders to keep my hands at nine and three, ultraconscious of the possibility that I’d have to disengage at any moment, trusting the passenger with the laptop to identify situations where the car’s assumptions might not square with reality, and knowing that Google does not dare to let its cars drive on streets that are not exhaustively mapped, I have difficulty viewing No Drive Day as imminent. We’re maybe 95 percent there, but that last 5 percent will be a lengthy slog. One other thing to consider: Google, at least as far as it admits, hasn’t even scratched the surface of big-city driving, which is Brick Lane vindaloo in terms of spiciness. If SDC pilots have to disengage when they encounter reckless drivers, autodrive will be available about zero percent of the time in Boston. When I share my pessimism with Chris Urmson, he says I’m mistaken. What I have observed in Castle and Mountain View, he tells me, is a function of Google’s obsessive need for safety during a period of testing. Its caution comes because constantly probing for weaknesses and exposing them while avoiding risks will bring the cars closer to the moment that the general public can leave the driving to Google. When I ask him when he believes that will happen, he has his answer handy. “Before my son turns 16,” he says. Chris Urmson’s son is now 12 years old. I mentioned a second consequence of my adventure. Not driving the Google car changed the way I drive real cars. Hopping into my rental car the next day, I was hyperaware of every potential complication and threat. I found myself mentally constructing an x_view of the conditions around me, gauging where dangers lay. By trying to mimic the vision and caution of a Google car—which tries to think like a human, without the human failings—I believe I’m a better driver. But no matter how good I am, I’ll always be prone to the lapses of attention and limited perception of a flesh-and-blood driver. 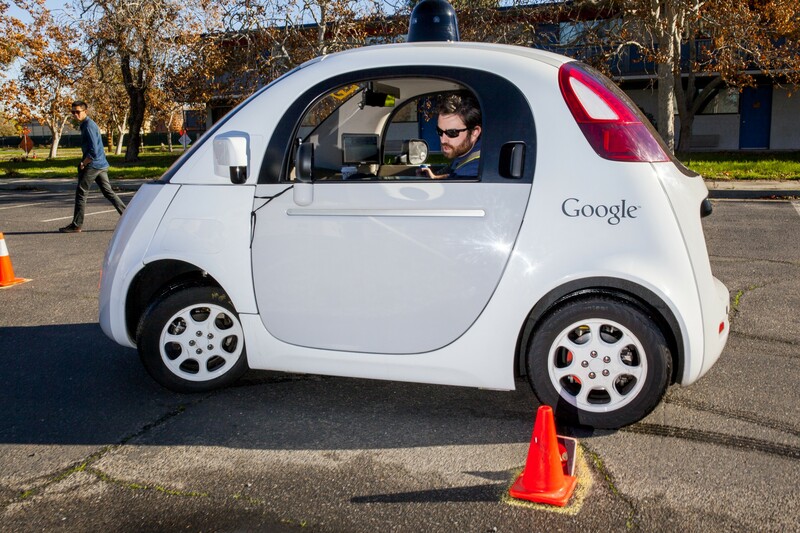 Google’s car has the edge there, and that advantage will grow. I will, however, merge into traffic more smoothly. And I never did brake for leaves. Photographs and gifs by Noah Rabinowitz. Car Week logo by Sasha Katz.